This sword of valor is one of only 23 given by Lloyd’s Patriotic Fund after the most decisive Naval battle the world had ever seen. William G. Rutherford, one of the heroes of the Battle of Trafalgar. Illustrated here is the handsome Rutherford grasping his prized sword which will be sold at auction on April 11th, 2017. Of the 23 swords given for Trafalgar, the locations of two are unknown and most of the others are in institutions. After viewing this sword, it would be difficult to believe there could be a finer example, especially in private hands. On Tuesday, April 11th, 2017, a rare, historic Naval treasure will be sold at auction in Fairfield, Maine by James D. Julia Auctioneers. 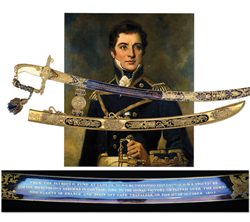 The sword was presented to Captain William George Rutherford (1764-1818) and is lot #1231 in this sale. Rutherford was born in 1764 in Wilmington, NC to a loyalist family. His father was John Rutherford of Bowland, Stow and his mother, Francis, was widow of Gabriel Johnston, the late Governor. The family returned to Scotland where young William was educated at the University of St. Andrews and in 1788 was first sent to sea aboard the HMS Suffolk. Rutherford had a successful Naval career. He was appointed by England’s all-time greatest Naval hero, Vice Admiral Horatio Lord Nelson. In 1805, he captained the 74 gun ship, Swiftsure, and later was dispatched to join the famous Battle of Trafalgar. Rutherford’s actions at Trafalgar proved decisive. 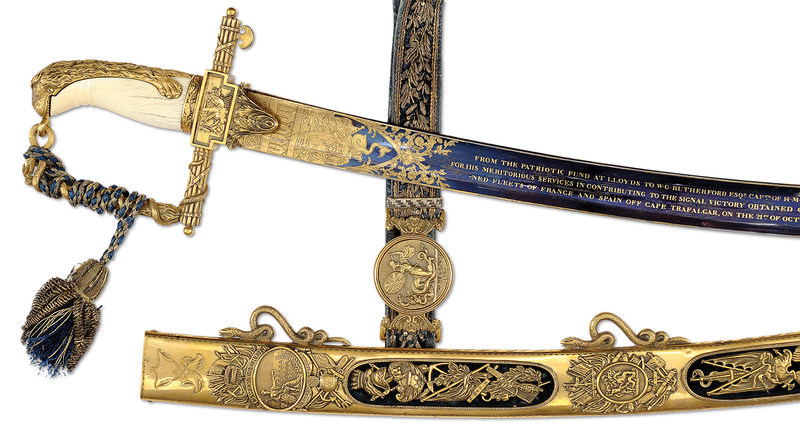 After the battle, he was awarded this extraordinary gold gilt and ivory sword. On October 21, 1805, Lord Nelson’s 27 ships of the line defeated 33 French and Spanish ships. This was not before his high-risk, but accurate strategy won the most decisive victory of the Napoleonic wars. This triumph gave Britain control of the seas and established the foundation for Britain’s global power for more than a century. The Franco Spanish Fleet lost 22 ships; the British lost none. Admiral Nelson was mortally wounded in the fight. He received his fatal shot as Rutherford’s 74-gun ship, Swiftsure, was trying to tow the sinking French ship, Redoubtable, who had dueled with Nelson’s HMS Victory. As Rutherford was towing the Redoubtable, he was forced to cut the line when the French ship suddenly sank. Five Swiftsure men were among the hundreds who drowned. William Rutherford was the only American-born British Captain at Trafalgar. His cased sword is among the highest grade and expensive swords of its day, costing £100 at the time. Lloyd’s Patriotic Fund gave 23 such swords for valor after the most decisive Naval battle the world had ever seen. The steel blade on this sword is 32” long, decorated in blue and gold and is inscribed… “FROM THE PATRIOTIC FUND AT LLOYDS TO W.G. RUTHERFORD ESQr CAPtn OF H.M.S. SWIFTSURE / FOR HIS MERITORIOUS SERVICES IN CONTRIBUTING TO THE SIGNAL VICTORY OBTAINED OVER THE COMBINED / FLEETS OF FRANCE AND SPAIN OFF CAPE TRAFALGAR, ON THE 21ST OF OCTOBER 1805". The secondary inscription on a brass plaque mounted on the casing reads… "FROM THE PATRIOTIC FUND / LLOYD'S LONDON / to CAPTAIN WILLIAM GORDON RUTHERFORD / OF H.M.S. SWIFTSURE / 1805”. The sword’s ornate, gold gilt scabbard hilt and sword belt mounts are lavishly engraved and chased with detailed Naval patriotic motifs and details of the deeds of Hercules. There is no doubt that the Trafalgar victory was a Herculean task that ended Napoleon’s plans to invade England. To further honor Rutherford’s contributions, the Royal Navy produced a Captain-class frigate bearing his name, the HMS Rutherford. This frigate served from 1943 to 1945. Of the 23 swords given for Trafalgar, the locations of two are unknown and most of the others are in institutions. After viewing this sword, it would be difficult to believe there could be a finer example, especially in private hands. This sword has great provenance where it had stayed in the family for 157 years. It was brought to America in 1962 by Valmore Forgett, founder of the Navy Arms Company, and a collector of the finest early arms. This was his best and favorite sword; it will be offered publicly for the first time ever through James D. Julia. This extraordinary historic treasure comes to auction with a presale estimate of $150,000-250,000 and is the first of its type to be offered at auction in a matter of years. More history, as well as numerous illustrations and details about this important sword is can be found on Julia’s website by clicking here. Rutherford’s sword is part of an extraordinary offering of rare firearms, including important Confederate arms, noted outlaw Cole Younger’s Smith & Wesson revolver, Bowie knives, swords, historic Winchesters, rare military arms and headgear, and a spectacular diversity of superb high quality sporting arms, to be sold at the company’s April 11th-13th Fine Firearms auction in Fairfield, Maine. The sale starts at 10am each day. All items will be available for preview on April 8th-10th from 9am to 5pm daily. For more information on this can’t-miss sale, please see http://www.jamesdjulia.com. James D. Julia, Inc. is one of the top ten antique auction houses in North America as measured by annual sales and is the leading auction house in the world for high end, rare, and valuable firearms. The company conducts two extraordinary firearms auctions a year in Fairfield, Maine where clients from all over the world gather to compete on rare treasures such as this important sword. In business for over 45 years, the company routinely establishes new world records. Julia’s consists of three key divisions, including rare firearms and militaria; fine and Asian art and antiques; and lamps, glass, and jewelry. Each division is regarded for its excellence and is staffed with world-class specialists to insure fair and professional authentication, identification, and valuation services. For more information on James D. Julia, Inc., please visit http://www.jamesdjulia.com. The extraordinary Rutherford presentation sword. It comes to auction with a presale estimate of $150,000-250,000. James D. Julia is one of the top ten antique auction houses in North America as measured by annual sales and is the leading auction house in the world for high end, rare, and valuable firearms.